With less than a month to go, here’s what we know about Game of Thrones season 7 so far. HBO has just released the second trailer for season 7 of Game of Thrones and it’s full of spoilers that got fans exciting. 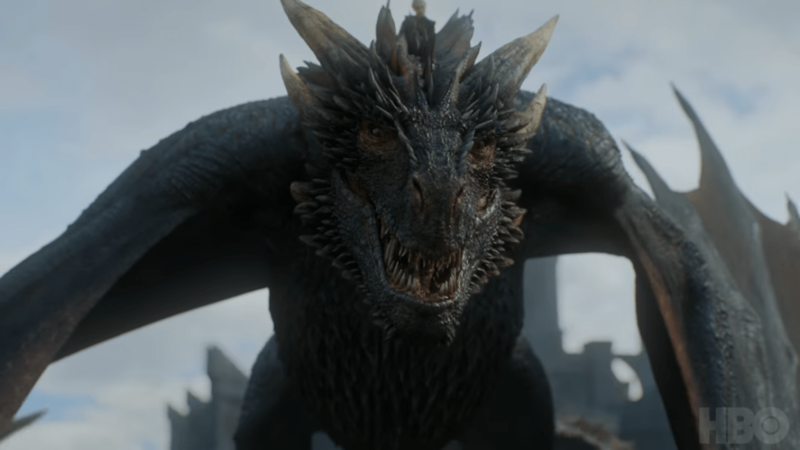 With never-before-seen footage, the two-minutes-eight-seconds long trailer, which shows a bit of every major character still alive, was enough for fans to come up with speculations over what is going to happen now that winter is here. Euron Greyjoy, who appeared last season to throw his brother Balon off a bridge and took his place as King of the Iron Islands, is expected to be the newest villain of the show, and it’s said that he will be the baddest we’ve seen so far. King Jon Snow and his army. 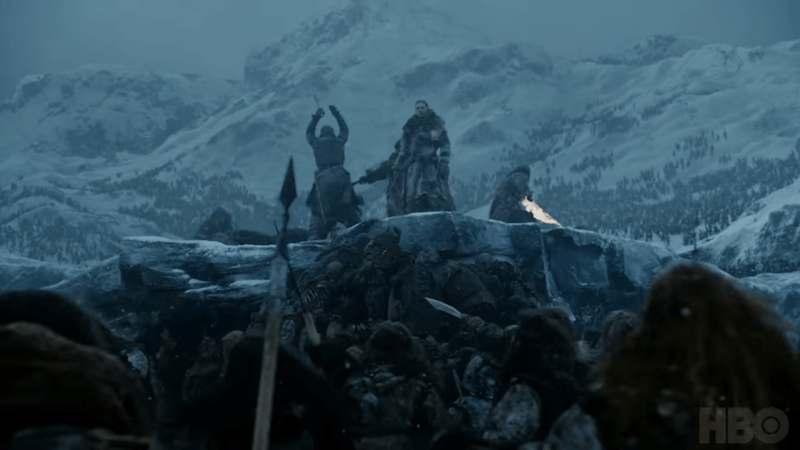 King Jon Snow, who is shown alongside his big army in the trailer, is believed to be part of a great and epic battle. But then again, what else would happen on Game of Thrones? Bran Stark and Meera Reed are seen arriving at the Wall, finally, with its gate opening up for them to pass through. The look on Tyrion’s face in the trailer seems to be serious and worrisome, sparking theories of him having reconsidering his alliance with Daenerys. For her part, Daenerys seems to be a lot stronger and tougher, especially since her dragons have grown massively. She can hardly be seen riding on top of one of her beasts. 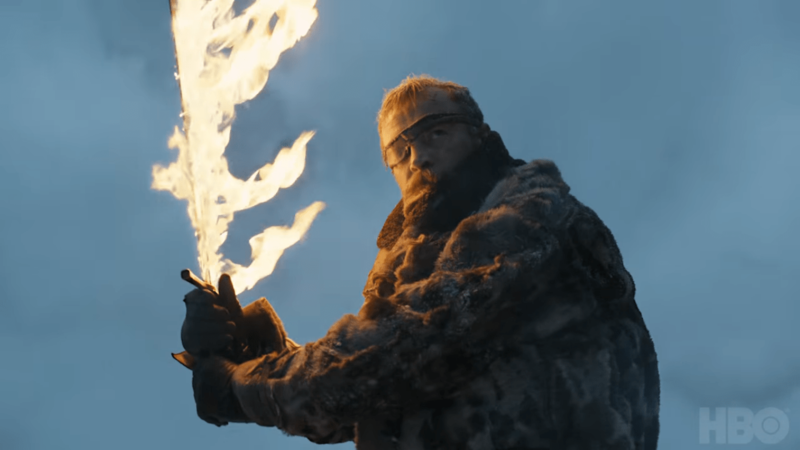 Beric Dondarrion, leader of the Brotherhood without Banners, appears to have resurrected and is wielding a flaming sword. Along with his fur apparel, it seems like they made north to join the battle against the White Walkers. Beric Dondarrion weilding the flaming sword in Game of Thrones season 7. Hopefully, this doesn’t mean that Jon Snow will die again, but that’s what happens on Game of thrones, you’re favorite characters get killed. Game of Thrones will return with season 7 on July 16.